For me, that was the key message of the World Economic Forum. The headlines may have talked about President Donald Trump’s “America first” speech, but the back story was the fragility of nation states in a time of technological change. The topic of “the digital economy and society” was the most popular this year at the WEF in terms of the number of sessions and social media buzz — and no wonder. The dirty secret of Davos is that the much-lauded “Fourth Industrial Revolution” — shorthand for the rise of ubiquitous automation, big data and artificial intelligence — is making most people less, not more, secure, at least in the short term. The ability of a range of companies — in insurance, healthcare, retail and consumer goods — to personalise almost every kind of product and service based on data streams is not just a business model shift. It is a fundamental challenge to liberal democracy. Consider the changes being wrought in the insurance business. For 200 years, it has been based on the notion of risk pooling: average the cost of insuring individual homes, cars and lives, and then divide the cost among the collective. In the age of data, insurance groups will be able to take information from tracking boxes in our cars or sensors embedded in our homes and use it to craft hyper-personalised policies. For example, you might be rewarded for putting a new plumbing system into your own old house (the sensors will measure how well it works), or stopping more quickly at red lights. But you might also be blamed when your 16-year-old puffs weed in his bedroom (smoke detectors will relay the message to your insurer in real time) or if you fail to shovel the snow off the front stoop before it ices up (now insurers could know exactly when and if you did, and limit their own risk of liability if a passer-by slips). Of course, you’ll be able to opt in and out of all this, though probably not very transparently or cheaply (consider that on commercial platforms such as Facebook or Google, you basically have to forfeit your rights to use the product or service easily). But the more disturbing implication is that there may now be an uninsurable underclass who can no longer be floated by averaging. Who will insure them? Most likely subprime lenders or the state. Which brings up another dirty secret of the digital age. Just as the US government has for years subsidised low-cost retailers that do not pay their workers a living wage, so the government will probably be asked to underwrite the safety net for a new digital underclass. The problem is that the public sector does not have the capacity to do this. It is coping with trillions of dollars of debt that has been created since the financial crisis, not to mention more partisan politics that make it tough to create consensus on much of anything. As digital bifurcation grows, it is very likely that disenchantment with the state will increase as well, fuelling the vicious cycle of political disenchantment and dysfunctional economics. The other risk is that rather than demanding more, not only of governments, but of the companies that are monetising our data, citizens will remain passive. Mr Soros noted the risk of “alliances between authoritarian states and these large, data-rich IT monopolies that would bring together nascent systems of corporate surveillance with an already developed system of state-sponsored surveillance”. It sounds Orwellian, but it is the state of play in China, where the country’s big technology groups and the government are closely aligned. Indeed, some of the digital scientists I spoke to in Davos professed envy for the ease of data gathering even as they expressed their concerns about the political implications. This is why the most optimistic moment I had in Davos was with Illah Nourbakhsh, a professor at the Robotics Institute of Carnegie Mellon, who, having become quite worried about the points I have just made, launched a project to educate elementary school children about the power of data, its risks and rewards, and how to use it to advocate for themselves. Under the scheme, children might track, say, the number of cars idlingoutside their school, calculate the potential pollution generated, then call a family meeting to discuss how to “challenge the incumbent power structures”, as Mr Nourbakhsh says (translation: push their principal for new parking rules). The idea is to create a new generation of citizen scientists who understandthe power of data. I predict that if they truly do, they will start to demand a lot more ownership and control over it themselves. NEW YORK – The financial-services industry has been undergoing a revolution. But the driving force is not overhyped blockchain applications such as Bitcoin. It is a revolution built on artificial intelligence, big data, and the Internet of Things. Already, thousands of real businesses are using these technologies to disrupt every aspect of financial intermediation. Dozens of online-payment services – PayPal, Alipay, WeChat Pay, Venmo, and so forth – have hundreds of millions of daily users. And financial institutions are making precise lending decisions in seconds rather than weeks, thanks to a wealth of online data on individuals and firms. With time, such data-driven improvements in credit allocation could even eliminate cyclical credit-driven booms and busts. Similarly, insurance underwriting, claims assessment and management, and fraud monitoring have all become faster and more precise. And actively managed portfolios are increasingly being replaced by passive robo-advisers, which can perform just as well or better than conflicted, high-fee financial advisers. Now, compare this real and ongoing fintech revolution with the record of blockchain, which has existed for almost a decade, and still has only one application: cryptocurrencies. Blockchain’s boosters would argue that its early days resemble the early days of the Internet, before it had commercial applications. But that comparison is simply false. Whereas the Internet quickly gave rise to email, the World Wide Web, and millions of viable commercial ventures used by billions of people, cryptocurrencies such as Bitcoin do not even fulfill their own stated purpose. As a currency, Bitcoin should be a serviceable unit of account, means of payments, and a stable store of value. It is none of those things. No one prices anything in Bitcoin. Few retailers accept it. And it is a poor store of value, because its price can fluctuate by 20-30% in a single day. Worse, cryptocurrencies in general are based on a false premise. According to its promoters, Bitcoin has a steady-state supply of 21 million units, so it cannot be debased like fiat currencies. But that claim is clearly fraudulent, considering that it has already forked off into three branches: Bitcoin Cash, Litecoin, and Bitcoin Gold. 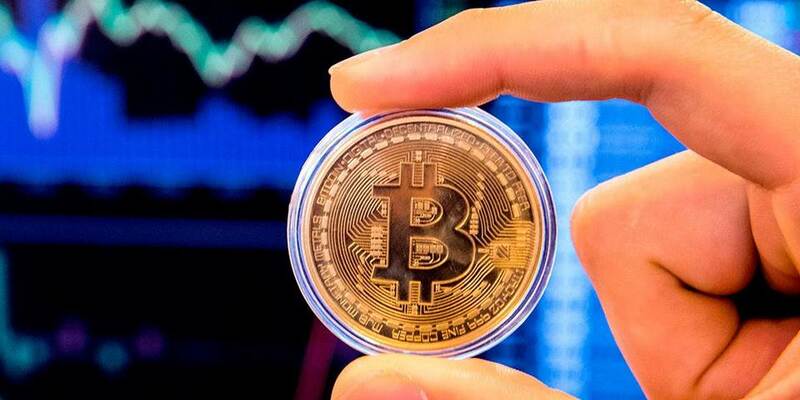 Besides, hundreds of other cryptocurrencies are invented every day, alongside scams known as “initial coin offerings,” which are mostly designed to skirt securities laws. So “stable” cryptos are creating money supply and debasing it at a much faster pace than any major central bank ever has. As is typical of a financial bubble, investors are buying cryptocurrencies not to use in transactions, but because they expect them to increase in value. Indeed, if someone actually wanted to use Bitcoin, they would have a hard time doing so. It is so energy-intensive (and thus environmentally toxic) to produce, and carries such high transaction costs, that even Bitcoin conferences do not accept it as a valid form of payment. Until now, Bitcoin’s only real use has been to facilitate illegal activities such as drug transactions, tax evasion, avoidance of capital controls, or money laundering. Not surprisingly, G20 member states are now working together to regulate cryptocurrencies and eliminate the anonymity they supposedly afford, by requiring that all income- or capital-gains-generating transactions be reported. After a crackdown by Asian regulators this month, cryptocurrency values fell by 50% from their December peak. They would have collapsed much more had a vast scheme to prop up their price via outright manipulation not been rapidly implemented. But, like in the case of the sub-prime bubble, most US regulators are still asleep at the Wheel. Since the invention of money thousands of years ago, there has never been a monetary system with hundreds of different currencies operating alongside one another. The entire point of money is that it allows parties to transact without having to barter. But for money to have value, and to generate economies of scale, only so many currencies can operate at the same time. In the US, the reason we do not use euros or yen in addition to dollars is obvious: doing so would be pointless, and it would make the economy far less efficient. The idea that hundreds of cryptocurrencies could viably operate together not only contradicts the very concept of money; it is utterly idiotic. But so, too, is the idea that even a single cryptocurrency could substitute for fiat money. Cryptocurrencies have no intrinsic value, whereas fiat currencies certainly do, because they can be used to pay taxes. Fiat currencies are also protected from value debasement by central banks committed to price stability; and if a fiat currency loses credibility, as in some weak monetary systems with high inflation, it will be swapped out for more stable foreign fiat currencies or real assets. As it happens, Bitcoin’s supposed advantage is also its Achilles’s heel, because even if it actually did have a steady-state supply of 21 million units, that would disqualify it as a viable currency. Unless the supply of a currency tracks potential nominal GDP, prices will undergo deflation. That means if a steady-state supply of Bitcoin really did gradually replace a fiat currency, the price index of all goods and services would continuously fall. By extension, any nominal debt contract denominated in Bitcoin would rise in real value over time, leading to the kind of debt deflation that economist Irving Fisher believed precipitated the Great Depression. At the same time, nominal wages in Bitcoin would increase forever in real terms, regardless of productivity growth, adding further to the likelihood of an economic disaster. Clearly, Bitcoin and other cryptocurrencies represent the mother of all bubbles, which explains why every human being I met between Thanksgiving and Christmas of 2017 asked me if they should buy them. Scammers, swindlers, charlatans, and carnival barkers (all conflicted insiders) have tapped into clueless retail investors’ FOMO (“fear of missing out”), and taken them for a ride. As for the underlying blockchain technology, there are still massive obstacles standing in its way, even if it has more potential than cryptocurrencies. Chief among them is that it lacks the kind of basic common and universal protocols that made the Internet universally accessible (TCP-IP, HTML, and so forth). More fundamentally, its promise of decentralized transactions with no intermediary authority amounts to an untested, Utopian pipedream. No wonder blockchain is ranked close to the peak of the hype cycle of technologies with inflated expectations. So, forget about blockchain, Bitcoin, and other cryptocurrencies, and start investing in fintech firms with actual business models, which are slogging away to revolutionize the financial-services industry. You won’t get rich overnight; but you’ll have made the smarter investment. - Now that the VIX ETP train wreck is the rearview, let's remind ourselves of what started us on the road to the selloff in the first place. - And let's look at what happened midday on Wednesday that brought the bond selloff fears back to the fore. - Finally, let's talk about everyone's favorite boogeymen: CTAs, risk parity, and vol. control. Ok, so I don't know if you noticed or not, but it was right back to worrying about the bond selloff on Wednesday. And you know what? That's as it should be, because after all, that's what started us down the road to the selloff in the first place. Two Mondays ago, I gently suggested that if yields didn't stop rising, equities were going to get hit. I even slapped a fun title on the article so as not to sound too alarmist: "Hey Guys, The Bond Selloff Needs To Stop, Like Right Now". Well, it didn't stop. And for all the reasons I laid out last weekend, that's a real problem. You're undoubtedly tired of hearing this narrative by now, but unfortunately I need to rehash it in order to discuss what happened on Wednesday so humor me and I promise to keep the retelling short. Up to a certain point, rising yields are seen by the market as a barometer of the robustness of the recovery; evidence (if you will) that deflation has been banished to whatever netherworld it hides in until the next disinflationary shock. So for a time, bonds can selloff and stocks can digest that selloff on the excuse that rising yields are saying something positive about the outlook for the economy. But if yields rise too far, too fast and that is catalyzed by a sudden upturn in inflation, well then it sets up a policy conundrum. In the U.S., that conundrum is as follows. If the Fed withdraws transparency (i.e. decides to stop allowing the market to have a say in how policy develops) on the way to leaning aggressively hawkish, they risk hiking too fast, bear flattening the curve, and pushing the economy into recession. That dark grey line represents the residuals of rates gamma on other measures of risk premia, in this case FX vol., IG spreads, rates levels and curve risk premium. 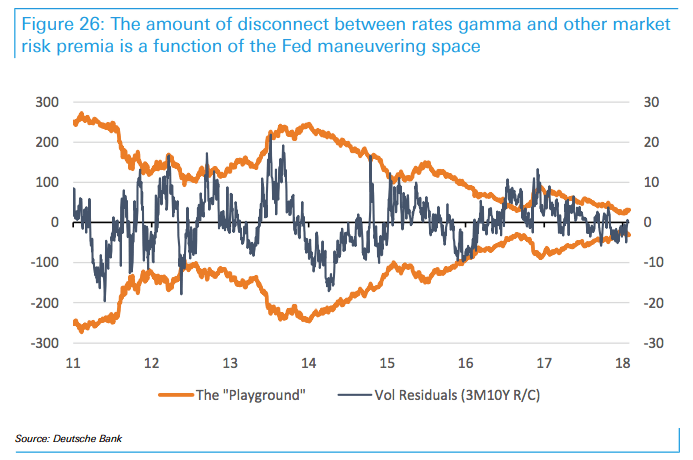 If that "playground" widens out, it's likely that markets would start differentiating between different assets again on the basis of something other than the carry those assets provide. If that happens, cross-asset vol. would rise, the carry trades could unwind, and on and on. So, that's why the market is worried about the bond selloff. The Fed will be forced to choose between potentially hiking too fast and the second scenario outlined above. Ok, so one of the things I've been keen on pointing out in the wake of the blowup in the short vol. ETPs, is that it won't be long before everyone stops being fascinated with that story and begins to think about what the problem was in the first place. That is, market participants will remember why stocks were selling off last week. In short, everyone would get back to focusing on the bond rout. You might recall that over the weekend, I tried to drive the point home about what the concurrent selloff in equities and bonds meant for balanced portfolios which have enjoyed the longest run without a 10% pullback in 100 years. 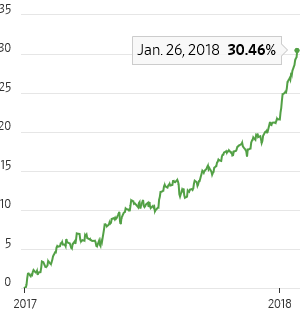 That run is in part attributable to the simultaneous rally in stocks and bonds, but the "genius" (if you want to call it that) of a 60/40 portfolio is of course the diversification benefit or, technically speaking, the negative stock-bond return correlation. When stocks are falling, bonds are rallying and vice versa. Well now that the VIX ETP debacle is in the rearview, traders have begun to focus on bonds again and on Wednesday, there were two catalysts for higher yields: a lackluster 10Y auction and a bipartisan budget deal that tipped more spending and a suspension of the debt limit. So yes, we're back to the original problem that spooked markets last week: the bond selloff and that problem is rooted in considerations about what rapidly rising yields mean for Fed policy as outlined above. Ok, so that's the first of the two things that matter. The second thing that matters is what I alluded to in my "Black Monday" recap. Namely, what the future holds for the systematic/programmatic strats that I and plenty of other folks have warned could be forced to deleverage into a falling market in the event things get bad enough. Obviously, you have to differentiate between these strategies. CTA does not equal risk parity does not equal... etc. etc. So what's the outlook? Well, I'm not sure. For one thing, it's as yet unclear what exactly is going on with those short vol. products and I for one wonder if there's more programmatic selling in the cards if volatility remains elevated. We may have leap-frogged concerns about the bond rout and gone straight to the part of the show where some of the celebrated "miracles" of modern market structure break down. Outflows resulted from index option gamma hedging, covering of short volatility trades, and volatility targeting strategies. These technical flows, in the absence of fundamental buyers, resulted in a flash crash at ~3:10pm today. At one point, the Dow was down more than 6%, and later partially recovered. After-hours, the VIX reached 38 and futures more than doubled—it is not clear at this point how this will reflect on various short volatility products (e.g., some volatility ETPs traded down over 50% after hours). Today’s large increase of market volatility will clearly contribute to further outflows from systematic strategies in the days ahead (volatility targeting, risk parity, CTAs, short volatility). The total amount of these outflows may add to ~$100bn, as things stand. Over the past 24 hours, I've spoken with a couple of quants and they of course dispute the notion that there is any real systemic risk associated with the funds that Marko Kolanovic helped thrust into the public eye in the wake of the August 24, 2015, meltdown. 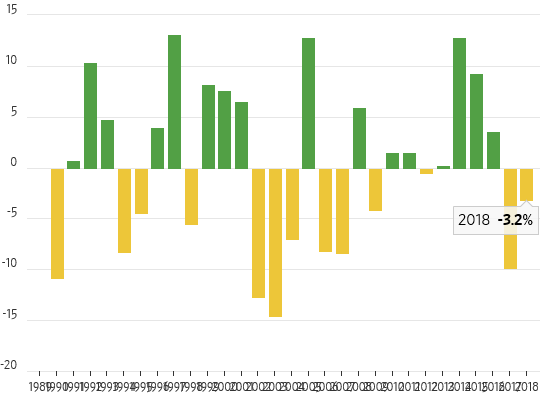 We think the bullish equity positioning has in part been supported by systematic investors, such as CTAs, vol target and risk parity funds, that have been attracted to equities by their low volatility, especially in recent months. As trend followers, CTAs (c.US $350 bn, Source: BarclayHedge) would in simple terms buy assets with positive momentum - and the recent negative short-term trend reversal in equities triggers selling. As Exhibit 16 shows, the net dollar CFTC long positioning in the S&P 500 has been correlated with the CTA beta to the S&P 500. Risk parity and vol target funds, which have combined AuM close to US$1 tn, have also likely increased their exposure to equities due to their low volatility - they use both realised and implied measures of volatility (and often also correlation). Based on a simple risk parity and vol target strategy, they are currently running very high equity allocations (Exhibit 17). Risk parity funds usually focus on longer-term measures (6m realised) while vol target strategies often use a shorter window, which suggests they are more likely to de-risk as a result of shorter periods of high volatility. Depending on where realised volatility settles in the coming weeks, selling from those funds might continue. For risk parity and procyclical multi-asset funds, the combined equity/bond sell-off can further increase pressure to reduce risk. Again, I am not going to profess to know what the likelihood of the worst case scenario there is, but what I can tell you is that's the second set of dominos in the "doom loop" scenario. The VIX ETP rebalance pushes vol. higher, and then the systematic crowd is forced to deleverage. That is a deliberately simplistic assessment and I've reached out to another quant who I hope will be able to provide me with a more benign take. I will certainly be happy to elaborate further once I feel like I have the proper first-hand information. Coming full circle, there are two things to watch going forward. First and foremost are yields. The bond selloff is what pushed us over the edge last week and set the stage for Monday and it will be what pushes over the edge again if 10Y yields rise sustainably above 3%. Second, in the event we do get more chaos and/or vol. remains elevated, you'll want to watch for signs of systematic deleveraging. So there's what to look out for in the days and weeks ahead. As usual, I hope it was informative. A weak dollar has been great for markets. A much weaker dollar could be too much of a good thing. The decline in the U.S. dollar in 2017—down 10% on ICE’s index—accompanied stronger global growth, in particular in Europe, and spurred risk appetite nearly everywhere. A broad measure of stocks around the world, the MSCI ACWI developed- and emerging-market stock index, rose 21.6% last year. 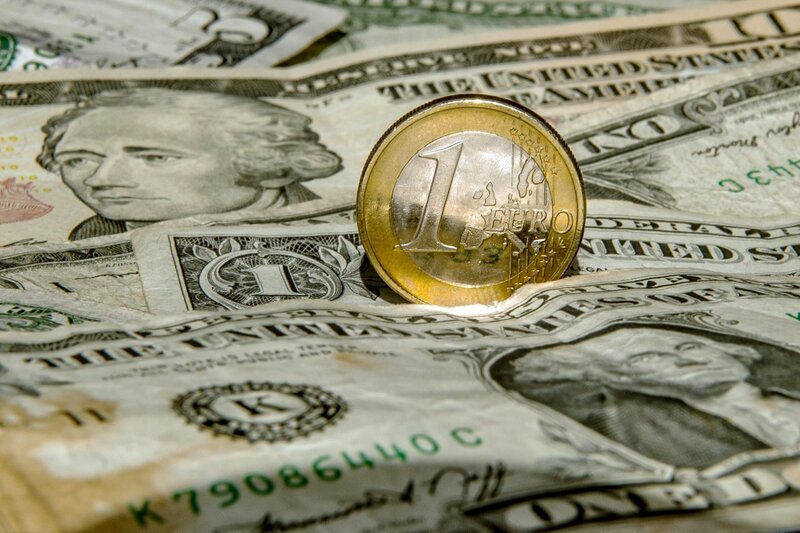 But last week’s quick-fire moves in the dollar might offer reason for caution in the longer run. The currency fell and rose rapidly as Treasury Secretary Steven Mnuchin, European Central Bank President Mario Draghi and President Donald Trump all weighed in with conflicting takes on foreign-exchange rates. Investors don’t appear fazed. 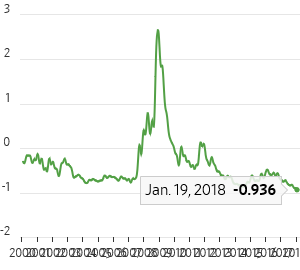 Stocks are up, corporate-bond yield spreads have compressed from already tight levels, and a modest rise in government-bond yields hasn’t derailed markets. A much weaker dollar could spur further risk-taking in markets where worries about valuations are already rife. But a further rapid fall in the dollar may yet cause headaches for central bankers who have created the conditions in which markets are partying. In the U.S., financial conditions have been loosening even as the Federal Reserve lifts rates. At some point, that might cause a reappraisal of policy, potentially upsetting markets that have come to rely on the idea that U.S. rates will peak much lower than in the past. Meanwhile, a much weaker dollar could spur further risk-taking in markets where worries about valuations are already rife. The move up in stocks has accelerated in 2018, with the MSCI ACWI up another 7.3% already. That might bring more debate about the risk of financial-market instability: after many years in which ultraloose monetary policy appeared not to bring dividends, it is suddenly having a turbocharged effect. Despite the acceleration in global growth and buoyant markets, even U.S. policy rates are still negative in real terms. The dollar’s decline thus bears watching. If the pace of the decline were to moderate, and be matched by strong global growth, then it is more benign. Otherwise, the dollar could test markets in unexpected ways. For the first time since 2008, all the world’s major economies are growing. A decade after the financial crash, the impediments to growth have mostly faded away. It goes without saying that economic growth is preferable to stagnation or decline, but not all the marks of the 2008 crash have been wiped away. What happened ceased to be a primarily economic problem years ago, and the effects of 2008 on the global political and social systems are to a great extent beyond the ability of economic growth to repair. Socially, 2008 widened the existing division between the elite and the middle and lower classes. But the problem isn’t simply inequality; it’s that the decline in living standards has hit the lower and middle classes disproportionately hard and has done significant damage to those near the median income. This has particularly been true in the U.S. and Europe, which together make up about half the global economy. In a continuation of a process that was underway before 2008, industries that employed many people continued to deteriorate or shift production overseas. Renewed growth will likely increase the incomes of those above the median income line but will do nothing to end the hollowing out of incomes below the line. This process has had a major political effect. Across European and American society, economic classes that were traditionally linked to left or center parties have shifted their allegiance. One major reason has been that the parties they have traditionally supported were advocates of free trade. The theory of free trade is that it benefits nations in the long run. The reality is that the benefits don’t necessarily get distributed to everyone. As important, the negatives of free trade are borne by the classes that can least bear it. Increased imports lower prices for those who can afford the goods, but for those who are unemployed or underemployed as a result of free trade, this is little consolation. In the long run it may all work out, but for a 50-year-old worker laid off from his job and now struggling at much lower pay in a more menial job, the long run is a meaningless concept. The employment problems generated by free trade inevitably express themselves as hostility toward immigration. In both the United States and Europe, hostility toward immigrants has soared, and immigration has gone from a peripheral issue to a central one. Citizens of these countries worry about threats to their culture as well as to their safety and security. Above all else, though, is the fear of job loss. When a class is hit by uncontrollable economic forces, the fear of unemployment or surplus labor is powerful. People with their backs against the wall respond sharply to any additional pressure. All this generated a powerful political response in the U.S. and Europe. The lower class, badly hurt by 2008 and untouched by the return of economic growth, turned on free trade and immigration. A political movement took shape, and it was made stronger by the fact that those who supported free trade and immigration were above the median income line. The two groups have rarely been so far apart. In the United Kingdom, for example, many people who opposed Brexit said they didn’t know anyone who supported it, and vice versa. Similar things were said in the U.S. after Donald Trump defeated Hillary Clinton in the presidential election, and in Germany after the nationalist Alternative for Germany party surged to become the country’s third-largest party, in the process badly damaging the party of longtime Chancellor Angela Merkel. The fixation on economic recoveries misses the point. The consequences of 2008 have taken root, and achieving higher economic growth without also solving these problems only increases tensions between those who benefit from the growth and those who don’t. And it isn’t only the poor resenting the wealthy; the wealthy regard the rise of nationalist political parties as somehow illegitimate. Just as the weaker classes fear for their futures, the wealthier classes dread seeing the poor rally around a cause that threatens the interests of the wealthy. In Brexit, Trump and many other elections, the well-to-do tend to feel that the outcome was in some way illegitimate. As some said of the Brexit vote, the people who voted “leave” were fooled by lies and simply couldn’t understand what they were doing. That is of course possibly true, but it’s hardly likely to heal social divisions. 2008 cemented into place a social division, which turned into a powerful political movement, unbounded by borders or oceans, challenging the legitimacy of old mainstream parties and, with them, the social legitimacy of those above the median income line. Two ideologies have emerged. One is the older liberal theory. The other is the newer nationalist theory. The older parties and those benefiting from the economic recovery are waiting for these movements to go away. They become excited at reports of economic growth. But these movements are not going away, and this ceased to be a matter of economics years ago.